Yesterday, I wrote about press releases and how they can be a powerful marketing tool for any business. While one facet of press release distribution is done offline â€“ by sending your releases to newspapers, magazines, TV and radio shows â€“ a second facet is online distribution. You can accomplish this by submitting your press release to one or several press release distribution services to maximize your impact. Here is a list of 15 press release distribution sites, a mix of free and paid options, for you to explore. 1888PressRelease.com: A free and paid service that provides a number of options, including distribution outlets, visibility and tracking statistics. 24-7 Press Release: A free and paid service with varying formatting and distribution options. Business Wire: A paid service (requires membership) that will distribute your press release to geographic, trade and industry media, and search engines. Express Press Release: A paid service that includes distribution to state-based sites, industry-specific blogs and a PR forum. i-Newswire: A free service that will allow you to submit one release per week to a global audience. Media Syndicate: A free service that focuses on distributing press releases for small and medium sized businesses. PR Leap: A paid service that distributes releases to all major search engines, newswires and websites. PR Newswire: A paid service (requires membership) that will submit your release to a number of outlets, including newsrooms, bloggers, financial portals, social media networks, web sites, and search engines. PR Urgent News: A free and paid service that allows up to three live links, targeted keywords and a thumbnail image with each release. PR.com: A free and paid service that provides an option that includes a full company profile in addition to distributing your release. PRBuzz.com: A paid service that distributes press releases to online news sites and blogs. PRLog: A free service that allows you to include HTML links in the press release body, creates a PDF version of your release and allows you to submit to specific categories. PRWeb: A paid service that distributes your site to numerous sites and lets you track and analyze results. SBWire: A paid service that allows you to submit releases for geographical and industry targeting. They also distribute your releases via RSS to numerous third party sites. The Open Press: A free and paid service that distributes press releases to numerous websites, blogs and RSS feeds. In order to get a good response from your press release, you donâ€™t need to submit to all of these sites. In fact, you shouldn’t; it’s just not a good use of time. A well-written press release with targeted, newsworthy and valuable information for your audience can be successfully distributed through one or two sites. Explore the options and pick the service that fits your needs best. Note that each of these sites have different formatting requirements and publishing guidelines that you must follow in order to have your press release accepted for publication, so be sure to read through all guidelines before submitting. 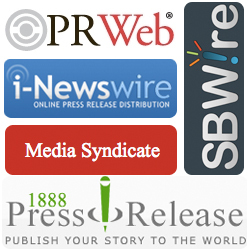 Do you use online press release distribution sites? Which sites have been most effective for you?